So who knew University of Tennessee’s ace pitcher – Bret Marks – is the son of Hooters of America CEO Terry Marks? I w as unaware until I read this fun profile story of the pitcher by Dustin Dopirak in Friday’s News Sentinel. Terry Marks – who pitched in the San Francisco Giants organization – is a former Coca-Cola Enterprises senior executive and former CEO of The Pantry convenience store chain before being recruited in October 2011 to Hooters to help fix the Atlanta-based chain. 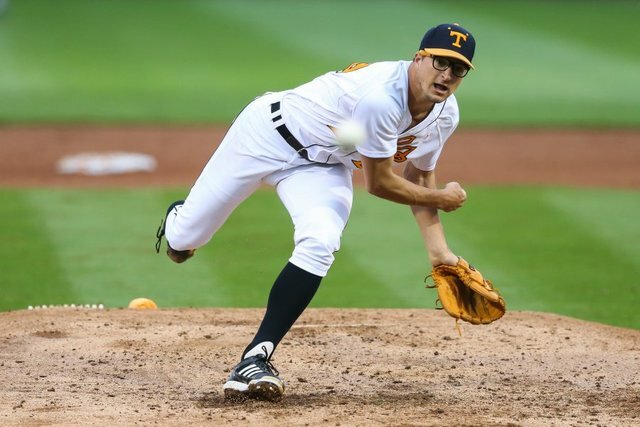 His son – who “bought a pair with thick black frames so he could resemble Charlie Sheen’s Rick ‘Wild Thing’ Vaughn character from the 1989 baseball comedy movie ‘Major League'” – came to Knoxville in 2014. This entry was posted in sports on May 1, 2015 by carlyharrington.